Come and join us for a taste of the action at Riverside Tennis Club where we will be running a variety of exciting sessions for all ages and abilities. The legendary Riverside BBQ will be in full force and the café will be open throughout the event. Everyone is welcome, so tell your friends and come and join us for a wonderful afternoon of tennis. At our event, please look out for the membership offer that will be available on the day. Children between 3 and 8 years old can get stuck into the world of tennis with an exciting programme from the LTA sponsored by Highland Spring. With smaller courts, nets and rackets and lower bouncing balls, LTA Mini Tennis offers the perfect introduction to the sport, with all the fun and energy of the real thing. No matter what your ability there is fun to be had on court. There are modified forms of tennis to meet all needs, book now to reserve you place. Get on court with your family and have some fun. We’ll provide modified balls and rackets for the younger ones on our 3x Mini Courts. We'll be on hand to give you some info on what you can do at the club and you can also take part in our other activities on the day too. You can book 30 minute slots on our 3x Mini Courts. 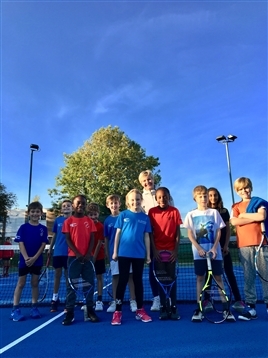 Children between 8 and 10 years old can get stuck into the world of tennis with an exciting programme from the LTA sponsored by Highland Spring. With smaller courts, nets and rackets and lower bouncing balls, LTA Mini Tennis offers the perfect introduction to the sport, with all the fun and energy of the real thing. Cardio Tennis is a fun, sociable group fitness class set on a tennis court and open to people of all ages and abilities. Supported by motivating music and qualified instructors, you’ll get to hit lots of tennis balls during your class and have a great cardio workout at the same time. Ages 18+ invited to get on court with Riverside members and coaches and play a few games where the emphasis will be on fun. Our members and coaches will be on hand to answer any questions. If you're unsure which activity you want to take part in, why not just register for the event without booking onto a specific session.